At Tino's, returning to the scene. Photo by Tess Falotico. An awkward first date at a New York deli turned into a marinara-drenched romance — this is Fathom intern Tess Falotico's Bronx tale. NEW YORK CITY – I go to school and live in a neighborhood so densely packed with delicious Italian food that you can't even tell which restaurant the scent of tomato sauce is coming from. Arthur Avenue recalls what Mulberry Street used to be — simple menus and old-school waiters listing off specials in thick accents. There's a cozy, romantic, first date-appropriate spot on every corner. So when my boyfriend, who didn't know the area, asked me out for our first date, why did I choose a deli? Dating in the old-fashioned sense of the word hardly exists in college. The idea of going to a real restaurant — the kind where you have to try not to spill wine on a white tablecloth — is beyond the realm of student comprehension. To someone whose previous first "date" was at the most dive-y of all dive bars, a full-on dinner seemed like way too much. So I panicked and picked a deli. 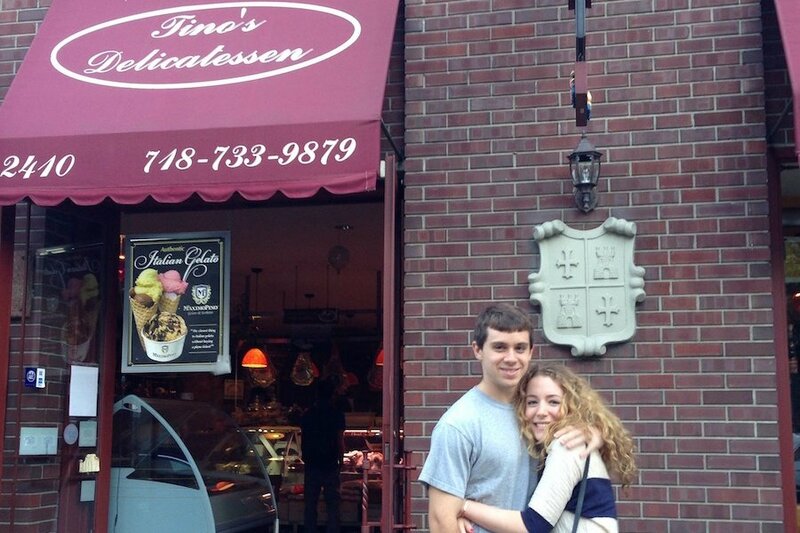 In my defense, Tino's is an Italian specialty deli where there is actual seating. I went for my go-to sandwich, the Isabella — chicken cutlet, mozzarella, roasted red peppers, basil, and plenty of garlic (to ensure flirty, first-date breath). He told me later that he had wanted to take me to a place with cloth napkins, waiters, and glasses made of actual glass. But it was at Tino's, with basil stuck between my teeth, that we got to know each other. As our relationship developed, so did our cravings. There were 3 a.m. pepperoni slices delivered from Pugsley's (595 E. 191st St.; +1-718-365-0327); teriyaki flank steaks from Vincent's Meat Market (2374 Arthur Ave.; +1-718-295-9048) for his birthday; pizza we made together with fresh mozzarella from Mike's Deli and sauce from Cerini. Then, of course, there was ravioli from Borgatti's, covered in the same bolognese he had first made me on Valentine's Day. I don't think it's a coincidence that our first fight, the first time we said "I love you," and the first time we made meatballs together all fell on the same tomato sauce-splattered weekend. As someone who tracks her life experiences in terms of food (see my bio below), it's only fitting that I fell in love on Arthur Avenue. Tess is a writer and cook living in Queens, New York. You can follow her on Instagram at @tessfalotico. She travels for the edible souvenirs.